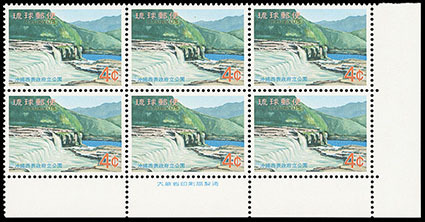 Ryukyus, Revenue, 1971, Unissued 4¢ Iriomote Park, corner margin inscription block of 6, o.g., never hinged, Very Fine, a very rare inscription block. Scott No. 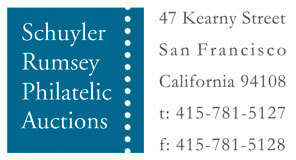 R unlisted; $1,050 for singles Estimate $500 - 750. 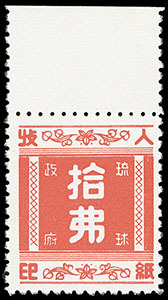 This stamp did fiscal duty by providing the frugal Okinawan Administration with a validating device for their currency conversion certificates. 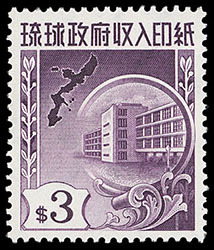 Though it never saw use as the commemorative Iriomote Park stamp it was originally intended for, it eventually fulfilled the function of being the necessary stamp to validate these money changing certificates. Ryukyus, Revenues, 1952-54, 1y-1,000y complete, 1y-100y all bottom margin imprint singles, o.g., 500y lightly hinged, others never hinged, a Very Fine set. Ryukyus, Revenues, 1958, 1¢-$10 complete, 1¢ left margin horizontal pair, others all top margin singles, without gum as issued, bright and fresh, a Very Fine set. 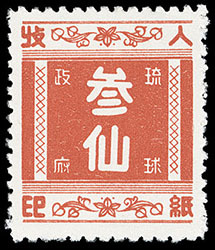 Ryukyus, Revenue, 1958, 3¢ red, compound perfs, vertical perfs 11.2, perf 10.8 at top and perf 10.2 at bottom, without gum as issued, choice centering, Extremely Fine, the only known example of this compound perforation variety, ex-G. Baxley. Scott No. R10 var. Estimate $300 - 400. 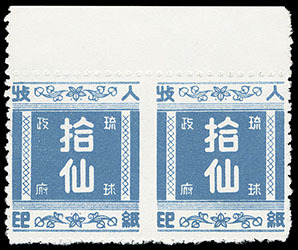 Ryukyus, Revenue, 1958, 10¢ blue, imperf between, top margin horizontal pair, without gum as issued, fresh and well centered, Very Fine and choice, very scarce. Ryukyus, Revenue, 1959-69, 1¢-$10 issues, o.g., never hinged, choice centering throughout, rich colors, a Very Fine set. Ryukyus, Revenue, 1969, $50 black, in combination with Revenue, 1969, $5 orange (R27) on 8x13'' legal document, both tied by red seal handstamp, document with "U.S. $317,328.00" typed in at bottom, Very Fine. Scott No. R31 Estimate $4,000 - 6,000. 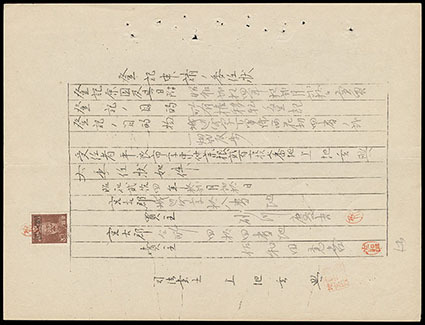 THE UNIQUE ON DOCUMENT USAGE OF THE 1969 $50 REVENUE HIGH VALUE ISSUE. 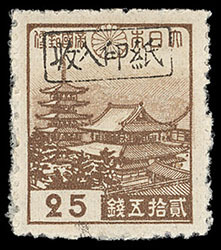 Ryukyus, Miyako District Revenue, 1948, 25s dark brown & pale brown, black overprint, o.g. (interleaving adherence), well centered, bright and fresh, Extremely Fine. 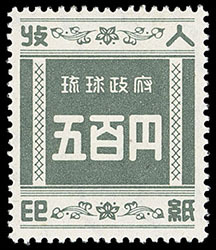 Ryukyus, Miyako District Revenue, 1948, 3s brown, black overprint, tied by red chop seal handstamp on fresh legal document, Very Fine, very scarce. Scott No. 3XR1 Estimate $400 - 600. Ryukyus, Japan, 1951, 1000 B-Yen Allied Military Government Currency Note, serial no. E2742784E, crisp and uncirculated, Extremely Fine, choice and scarce (R.P.S.S. MC-8E); with 2002 R.P.S.S. certificate.